For whatever reason, Valve deemed last weekend to be worthy of celebration, and in addition to offering a welcome discount, offered a free trial for their action-packed zombie fest Left 4 Dead. Never one to pass up on such offers, and having a few friends who’d already bought the game, I spent a fair few hours last weekend testing the game out, enough so to have convinced me to actually buy the thing! 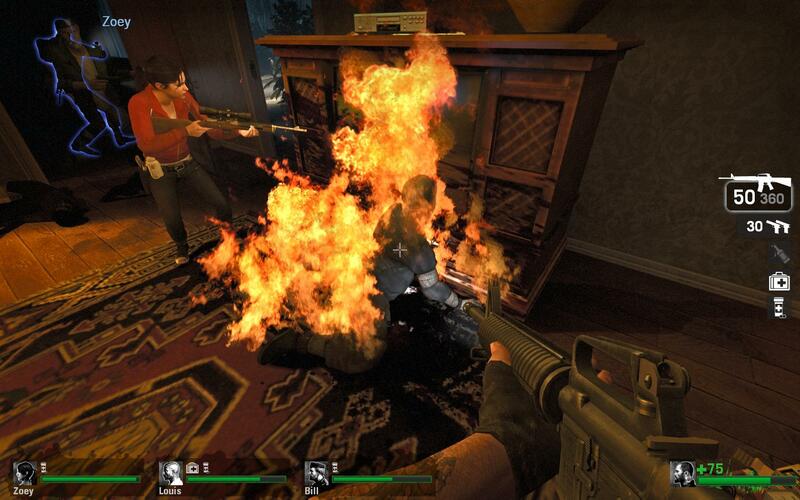 Whilst Left 4 Dead sits firmly in the survival horror genre, it is without a doubt a shooter through and through. Whilst the genre may have its early origins with games like Alone in the Dark, Left 4 Dead is to that what 28 Days Later is to Night of the Living Dead. It’s a high-energy bloodbath, which is well and truly the game’s essence. Forget setting, plot or character development, the game boils down to an assault course for four, through levels strewn with zombies to some method of escape, with occasional safe points along the way. That might not sound particularly novel, but the game’s central tenet is its co-operative side. Whilst there are plenty of games past that have featured zombies in one way or another, none have quite provided the experiences associated with the stereotypical zombie genre. Left 4 Dead clearly owes a lot to the zombie movie, from the opening intro to the closing credit sequences, and the gaming world has been truly aching for such a game. Mods such as Zombie Panic! or Zombie Master filled a gap, but Left 4 Dead has made full use of the Source engine to create a movie experience built for four. Over the trial weekend I was lucky enough to have had 3 experienced veterans to guide me through the game’s four campaigns. Each features the characters making their way through a typical dystopian setting, liberally sprinkled with the living dead, towards some form of rescue. Generally the levels are punctuated by minor set pieces, and an occasional pause whilst something important happens, during which time the characters have to hold their ground as a horde of zombies is thrown at them. Whilst that might sound simple enough, and nothing that a player couldn’t manage on his own, without those extra three guns a player would quickly find it difficult if not impossible to withstand the tide of brain eaters. 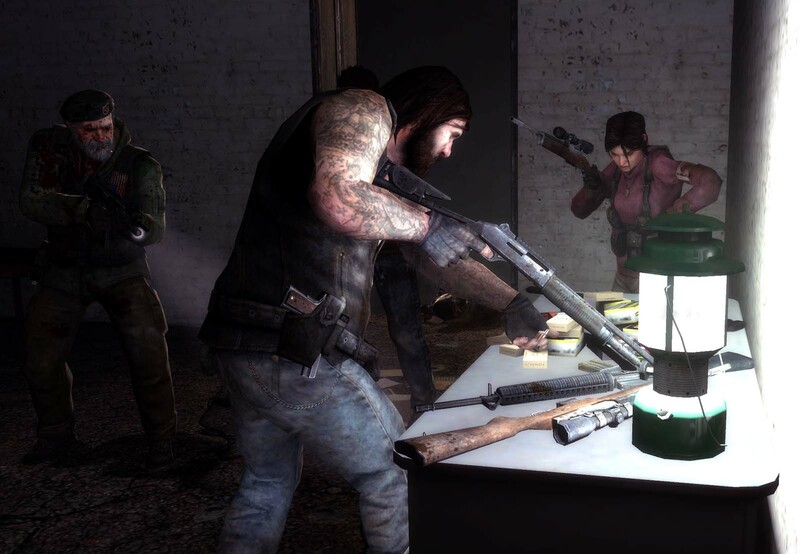 In terms of the teamwork element, Left 4 Dead is quite probably one of the best co-operative gaming experiences to date. Although there are plenty of other games with co-op modes built in, these tend to add nothing to the single player mode save having to find extra weapons and health packs for your companion(s), and you might as well be running around on your own for all the use that the extra players bring. In Left 4 Dead, however, running off on your own will likely soon find you lying under a rugby scrum of zombies all trying to take a memento of your flesh. Players can easily become ‘incapacitated’ by being trodden down under the weight of too many fiends, or else attacked by one of the few special zombies each equipped with certain abilities. Without another player handy to rescue them, it would soon be lights out. If the game owes so much to its shooter heritage and zombie film inspiration, then we can thank Valve that it plays like it should. That is to say, if you’ve played other FPS games and seen a zombie film or two, you should know what to expect. The game is peppered with time- and thought-saving features that generally go unnoticed, but which all serve to make the game run so seamlessly. Take the weapons, for example. Each player immediately comes equipped with a pistol with unlimited ammunition, which for anyone who’s experienced being reduced to playing an FPS with nothing more effective than the tattoos on your knuckles and harsh language as a means of defending yourself, immediately appeals as a good idea. The player chooses their main weapon from a small selection of the usual suspects arrayed out at each safety point in the campaign (i.e. the beginning of each stage), and ammunition is available in occasional piles scattered throughout the levels, regardless of weapon. Aside from those two guns, players can take one medikit, one grenade and one packet of pills (a temporary health booster), all of which prevents players from stockpiling weapons from their teammates, or having to constantly swap around guns for lack of ammunition. The clever level design is another efficient time-saver. Rather than have players walking around as headless as the zombies they’re trying to avoid, the levels are laid out fairly simply and intuitively, each section leading to the next. When there is an occasional set piece, the task is highlighted so that the players know exactly which lever to press, which lift to climb into, or which radio to use. This highlighting feature is also used to show players where their teammates are, by displaying bright blue outlines of the players when they would normally be out of sight behind objects, a really excellent idea that serves to prevent players from getting completely lost and separated from the group, and really comes into its own when a player finds himself incapacitated or smothered by a wall of undead flesh. Without that ghostly blue outline to help find him, a player might as well put his calls for help on hold and enjoy the cheesy lift music. The regular campaign mode, although perhaps the highlight of the game, is only a part of its repertoire. When you’re fed up of running through the campaigns as a survivor (of which more later), the option is there to put the boot on the other foot and play as one of the opposing ‘special’ zombies against a team of survivors. Each of the four zombie types has its own special ability to cause general mayhem and suffering, ranging from the Hunter, a nimble, springy beast that might remind players of the alien mode in Aliens vs. Predator, through to the rarer but more dangerous Tank, a lumbering beast that takes some serious firepower to stop, somewhat resembling the untoward appearances of Mr. Hyde in The League of Extraordinary Gentlemen. The way the zombie players spawn in is another nice feature of the game, having them able to see the ghostly outlines of the other zombie players before they choose their spawning location, as well as being able to follow the survivors around, seeing their outlines through walls, thereby being far more able to set up ambushes and the like. Although an interesting idea, from what I’ve seen the mode really doesn’t have all that much to endear itself. The zombies, although now perhaps a little more coordinated being human controlled, are still just as easy to spot and kill as when controlled by the AI, with the zombies making the same giveaway noises they normally would: the projectile vomiting Boomer zombie eliciting sounds dreadfully similar to those heard in most British city centres on a Friday night. Added to that are the sadly long spawn times between lives, and the players on the zombie team inevitably end up feeling rather more like spectators than participants. Fortunately the teams are usually swapped at the end of every segment and the two quartets compete as to who can complete the levels with more of their brains unchewed, but it still doesn’t add very much to the original co-op mode, and feels rather much a cute novelty than a real gaming mode. In fact, Left 4 Dead at times appeals to the rather more cynical side in me, which suggests that the name for the game really came about when the developers stopped working on the project and moved on to other things. The original four campaigns in their co-op mode are thoroughly enthralling, and the versus mode at least offers some variation on the theme, but playing through the same four segments repeatedly soon gets very tired. Naturally there are different difficulty settings—but which FPS doesn’t have one of those—and the so-called “AI director” does at least ensure that the segments aren’t entirely predictable, by changing the locations of health, ammo and special zombies and calling in zombie hordes occasionally. But honestly, whether a horde of zombies appears a third of the way through the level rather than at the half-way stage isn’t exactly the most radical alteration worthy of a repeat performance. With the help of a team of experienced zombie fest veterans, I managed to play through the four campaigns in the one evening of the free trial, arguably exhausting a good chunk of the game’s playability. And despite that fact, still went out of the way to buy the game. In fact, as ever with Valve, actually parting with my money was a more difficult feat than pre-loading the game and taking advantage of the free trial. Apparently, purchasing from them using a payment method that isn’t tied to the country you’re in is considered somehow suspicious by Valve, a completely retarded policy if ever I heard one, which I swiftly outmanoeuvred through a bit of remote administering of a computer in another country. This wasn’t even the first time I had difficulties paying via Steam, having had accounts locked in the past for using payment methods in ways deemed incompatible with their policies. But I digress. Although I was persuaded enough by the trial (and the discount!) to buy Left 4 Dead, as the package currently stands it really doesn’t live up to its regular price tag. The original co-op campaign modes are really well made, and easily one of the best four-player co-op experiences available in an FPS, but with around an hour’s playtime for each, the game weighs in extremely short in terms of regular play, replayable though it is. The versus mode on the other hand has its moments, but in general doesn’t live up to expectations, and really feels more like a way of distracting four players whilst the other team actually plays through the game. What Left 4 Dead really does have on its side, however, is Valve’s reputation as developers. Their dedication to adding features and fixes long after a game’s release is certainly to be factored into the game’s longevity. There was recently a new game mode introduced, which I haven’t yet had the time to try out, and no doubt there are many other ideas swimming around in their fertile little minds. 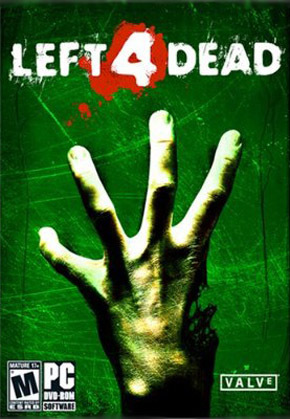 As with many developers today, Valve’s development cycle really has shifted much further beyond the release date than ever before, with Left 4 Dead being a perfect example of a game released in a half-complete state in terms of content, albeit that half being well polished and gruesomely good fun! And if you came here mistakenly expecting to read something entertaining, here’s a saving grace in the form of Yahtzee‘s wonderful 4 minute Left 4 Dead review. Thanks for reviewing Left 4 Dead, it looks like a pretty intense game, I especially like the co-op mode, it gets really crazy with all those zombies!